If your bays are bare, brighten your windows up at Blinds.com. They have everything you want in the way of blinds, shades, shutters, curtains, dressings, and draperies. Did we mention skylights and arches, cornices, and other unique alternatives? Decorate your home for beauty and function with a Blinds.com coupon code. Nothing jazzes up a decorating space quite like a handsome window dressing. Camouflage your casements at Blinds.com, the #1 provider online of blinds, shades, shutters, draperies, curtains, window dressings, skylight covers, valances, and other unique alternatives. Shop by brand, feature, room, purpose, or see if anything catches your fancy in the sale section. The helpful customer service representatives are just as fanatical about fenstrellas as you are. Contact them to help you with your window design projects seven days a week. Search for a local professional to measure and install treatments at Blinds.com. Or, just read their DIY section and then do-it-yourself. Lunette lovers know there are an incredible number of features and combinations that you can use in a window treatment. Blinds.com lets you search by almost any of them. For blinds alone there are 20 different types in 11 different color groups, and six separate options for cord type. Unless you decide to go with the motorized or routeless models, which have no pullstring. Interior decorators and designers should subscribe to the Blinds.com blog The Finishing Touch and follow their boards on Pinterest. In 2001, Blinds.com was founded in Houston, Texas. They are ranked as the 'Best Place to Work' by Houston Business Journal, and are one of the Top 100 companies in Houston. The accredited retailer was a BBB Award of Excellence Winner in 2009. The company is the number one provider of blinds in the US, Canada, and UK. UK shoppers should visit their partner site www.blinds-on-line.co.uk and Canadians should try www.blinds.ca. So when you’re fed up with your fenestrations, obscure the oriels at Blinds.com. 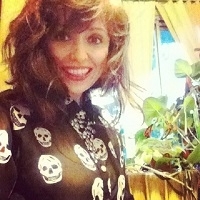 Don’t let Peeping Toms peer into your parlor! Use a Blinds.com coupon code and plug up those portholes. You may be amazed to learn that there are even situations in interior decorating that call for a coupon code. Read more to find out how I saved $50 off new faux wood shutters for my windows. It all began with a Blinds.com coupon code. 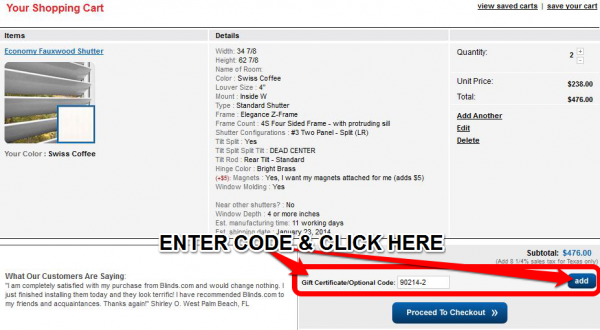 If Blinds.com is the leading supplier of blinds, shutters, and draperies online, then the might have coupon codes. So I head over to their profile on CouponPal to scope out all of the deals in one place. When I click on one of the Blinds.com coupon codes, it opens in another window for easy reference. 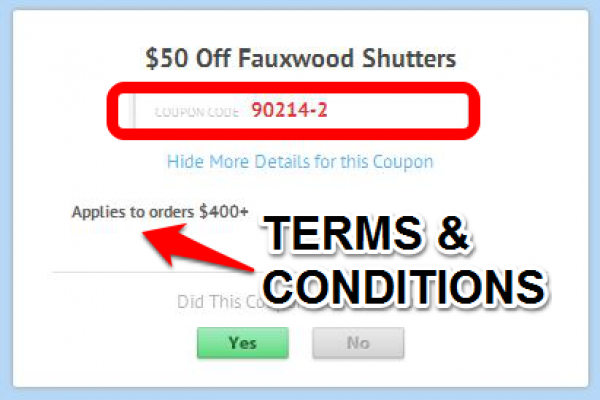 Here it says I can get $50 back if I buy Fauxwood Shutters, which is exactly what I needed! Step 3) Select a qualifying product. 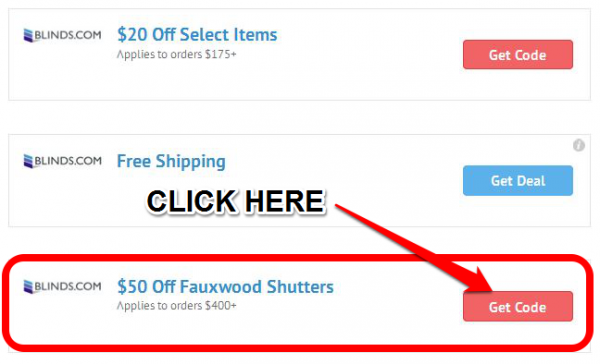 There are three kinds of faux wood shutters in stock, but this coupon is for the brand Fauxwood. That’s one of those terms and restrictions we talk about. This Economy Fauxwood Shutter will give a countrified air to my living space. I must have two. Step 4) Enter coupon code at checkout. After a lengthy customization process (make sure you have ALL your window’s measurements!) it is time to enter the Blinds.com promo code at checkout. I have successfully received $50 off my purchase. Now I can make an array of colorful throw pillows using materials I buy with the money I saved. Blinds.com prides themself on providing helpful customer service seven days a week. So if your question does not appear here, try calling, or their live chat service at Blinds.com, or Face-2-Face them in a video conference. These are some of the most frequently asked questions they hear. Are there free samples by any chance? You can request free sample packs online at Blinds.com! They might even throw in a coupon for a certain amount off of your next purchase. How accurate are these images? Color tones and gradation appear differently depending on which way the light hits them. There may be subtle shifts in color. But you can always request free samples before you buy it. Do they sell second hand products? Some window specialists sell used or refurbished items. But Blinds.com does not sell second hand goods. In what way should I measure my window? Blinds.com offers measuring instructions at their website. It's a great resource for learning how to measure arch tops, skylights, drapery panels, fabric valences, blinds, horizontal shadings, plantation shutters, roller or solar shades, honeycomb cells, roman shades, vertical blinds, and other special measurement considerations. What is a window mount? There are two basic kinds of mounts, the inside mount and the outside mount. An inside mount looks neater because the frame is concealed within the window. If the depression is too shallow for this, then you will need an outside window mount. Can they send screws and fasteners? They will send screws and fasteners for a low additional fee. However, Blinds.com does not guarantee that they will work on every surface. They also send an instruction booklet in the box. Will international orders be accepted? Canadians who want to order blinds should visit the partner site at www.blinds.ca. Europeans should try their UK partners at www.blinds-on-line.co.uk. Unfortunately, residents of Hawaii or Alaska do not qualify for the free shipping offer. Are blinds covered by a warranty? Blinds.com offers a warranty for their own custom made products. For other brands, consult directly with the manufacturer.